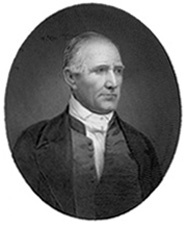 HOUSTON, Samuel, (father of Andrew Jackson Houston and cousin of David Hubbard), a Representative from Tennessee and a Senator from Texas; born at Timber Ridge Church, near Lexington, Va., March 2, 1793; moved about 1808 with his widowed mother to Blount County, Tenn.; attended Maryville Academy (now Maryville College), Maryville, Tenn.; employed as a clerk in a store in Kingston, Tenn.; enlisted as a private in the United States Infantry 1813; served under General Andrew Jackson in the Creek War, rose to lieutenant, and resigned from the Army in 1818; studied law, admitted to the bar in 1818, and commenced practice in Lebanon, Tenn.; district attorney in 1819; adjutant general of the State 1820; major general 1821; elected to the Eighteenth and Nineteenth Congresses (March 4, 1823-March 3, 1827); Governor of Tennessee 1827-1829, when he resigned; moved to the territory of the Cherokee Nation, now a part of Oklahoma, was a trader, and was made a member of the Cherokee Nation by action of the National Council; moved to Texas around 1835 and was a member of the convention at San Felipe de Austin, the purpose of which was to establish separate statehood for Texas; member of the constitutional convention in 1835; commander in chief of the Texas Army; successfully led the Texans against the Mexicans in the Battle of San Jacinto in April 1836; first President of the Republic of Texas 1836-1838; member, Texas Congress 1838-1840; again President of the Republic 1841-1844; upon the admission of Texas as a State into the Union was elected as a Democrat to the United States Senate; reelected in 1847 and 1853 and served from February 21, 1846, to March 3, 1859; chairman, Committee on Militia (Thirty-first through Thirty-fourth Congresses); Governor of Texas 1859-1861; deposed March 18, 1861, because he refused to take the oath of allegiance to the Confederate States; died in Huntsville, Tex., July 26, 1863; interment in Oakwood Cemetery. American National Biography; Dictionary of American Biography; Haley, James. Sam Houston. Norman: University of Oklahoma Press, 2002; Campbell, Randolph B. Sam Houston and the American Southwest. New York: Pearson Longman, 2007 (3rd ed. ); Houston, Samuel. The Autobiography of Sam Houston. Edited by Donald Day and Harry Herbert Ullom. 1954. Reprint. Westport, Conn.: Greenwood Press, 1980.